The other day I mentioned that in future I shall be sharing with you some of my knitting. I have only recently taken up knitting and, in truth, I am not very experienced. I am slow and find my Fairisle is loose (and I lack the courage to tackle Aran) but I enjoy plain knitting. Up until recently I have made little cardigans and jumpers for my great nieces and nephews and for the new babies born to friends. However, a few months ago I decided to make Christmas presents for some of my family and friends. The other day I shared with you a crochet scarf I made for my niece. Today I am back to share a knitted scarf and bobble (beanie) hat I made for a special friend. As you would have gathered this friend is a West Ham fan, or so rumoured has it! Both the hat and scarf were made with Double Knit (Worsted). The scarf is simply rows of 1x1 rib, each stripe of colour is six inches wide and I made the scarf 6'6" long (or 7'6" of you include the tassells). 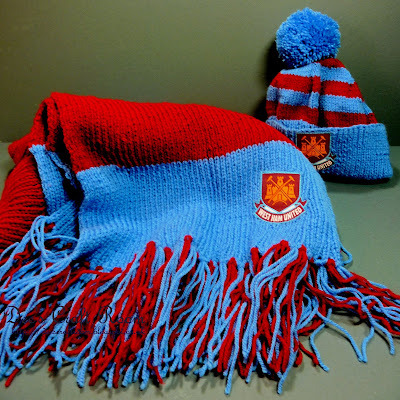 I used a pattern I purchased from ebay for the hat, the West Ham badges also came from ebay. I hope you have a very happy weekend. to make but I think it will be worth the wait ....fluffy bunnies! I thought about having a seperate blog for my knitting, or perhaps, a different page on my blog. Did you ever think of doing that? I am so pleased you did not, I think it is better to keep everything in one place and you can tell from the comments you get that the people visiting your blog now love your wildlife photos. I have found a couple of really good soft toy designers on Ravelry - bears, rabbits, elephants, mice but no squirrels. Clearly, they are missing something here. Oh wow another amazing creation! This is great! Thank you so much. I hope you are keeping well?